This legend, which is at least true in the basic details, took place in 387 BC after Rome became a Republic but before it became an Empire. We’ll tell the legend of the Capitoline Geese, which you can tell to the kids. Then we’ll print the story, with four panels which the kids have to put in the proper order. The kids can then can color and make the legend into a book. There is a legend that in the year 387 BC the Gauls crossed the Alps and entered the Italian Peninsula. They came searching for new land for their people and of course the wealth of the fertile north of Italy. By that year the Roman Republic was well established and the Romans had conquered or made treaties with enough of their neighbors that they were growing powerful. 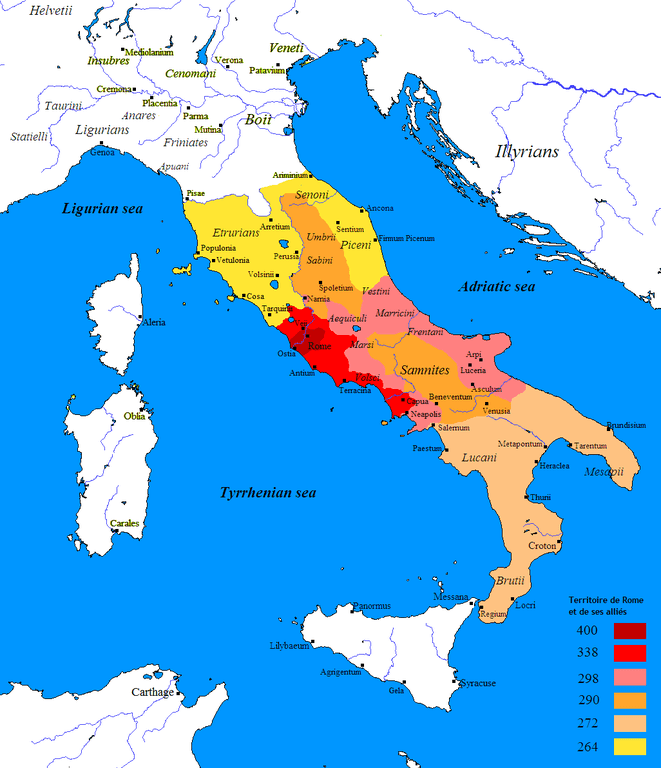 In this map the red portions are the areas that Rome held at the time of the Gaul invasion in 387 BC. While their actual territory was small they had treaties with many of their neighbors. They also had a fierce reputation for battle. But this was sort of like a small town champion basketball team meeting rivals from the big city. The Romans had no idea what they were going up against. This experience shaped their concept of the wider world and made them realize that if they wanted to be strong and expand their borders they would have to up their game, so to speak. The Gauls heard about the power and wealth of Rome and so they wanted it for themselves. The Romans were warned of the advance of these barbarians from the north and went out to do battle. The Gauls were more terrible than the Romans could have imagined. Many of them fought naked and their bodies were painted and tattooed with strange designs, their hair and their visages were twisted and cruel. Their battle cries were horrifying. Their weapons were wicked and they wielded them with an ease that no Roman could match. The Roman soldiers, every one, turned tail and ran back through the city gates, leaving the gates wide open in their panic. This is Brennus. 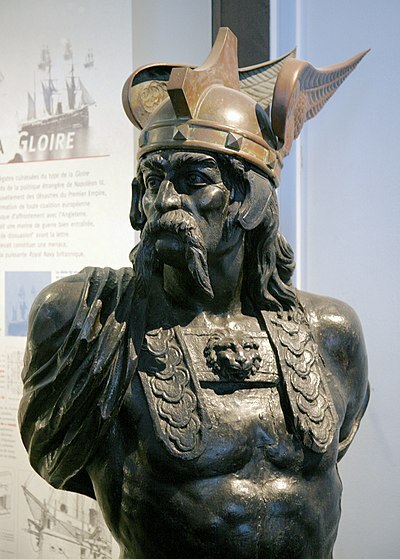 He was the leader of the Gauls who attacked Rome in 387 BC. Image by Med, CC license, Wikimedia. That would have been the end of Rome then and there except that Gauls were leery that the Romans had left the gate open as a trap. And so the Gauls waited for three days. During those three days the citizens of the city were able to flee to other parts and the remaining soldiers were able to entrench themselves on the Capitoline Hill. At length the Gauls decided the Romans really were cowards and they entered the city, sacking, looting, and burning as they went. But they could not breech the defenses of the Capitoline Hill. Then one night one of the Gaulish spies said he had found a way. They could climb up the back of the hill, up a steep cliff by means of handholds. If they climbed the hill quietly they could gather a strong enough force to battle their way to the gate and let their fellows in. Now the Capitoline Hill was the site of the temple of Juno. Since geese were sacred to Juno the priests kept a flock of geese on the hill. And even though the siege had been going on for many weeks and the soldiers were on short rations they left the sacred geese alone. It is lucky that they did for on the night the Gauls decided to scale the back of the Capitoline the sentries had fallen asleep on duty and the dogs were silently snoring. But the geese heard the invaders as they scaled the hill and they sent up such a cackling and honking and flapping of wings that Captain Marcus Manlius woke abruptly, grabbed up his sword, and rushed out to the parapet, calling his men as he ran. He was first to the wall, but others soon appeared at his right and at his left. They threw the Gauls back from the cliff. The siege continued on for a few more weeks but the Gauls grew bored and decided to make a treaty. The Romans were able to buy peace at a great cost. But Rome endured and one day grew to be a great empire. The Roman leaders negotiated with Brennus for the price Rome would pay for the Gauls to leave. They decided on 1000 pounds of gold. but the Gauls used cheater weights that were heavier than standard. 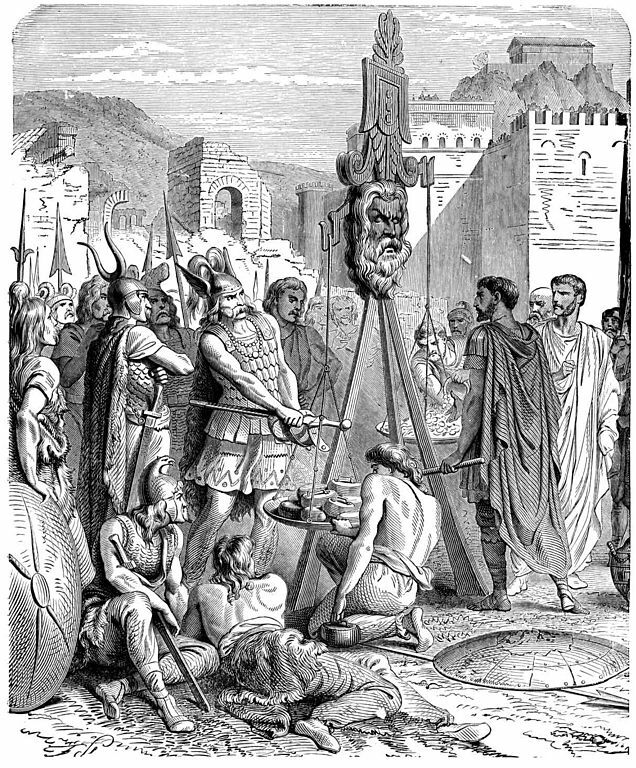 When the Romans complained, Brennus said” Vae Victus”, Woe to the vanquished, and threw his sword onto the scale as well. The sacred geese of Juno were honored every year after in a processional through the city commemorating their defense of the city of Rome. This is a printable of the Legend of the Capitoline Geese. The parts of the story are out of order. There are circles on the corner of each page. Kids should write the order the panels should come in in the circles. Then they can color and cut out the pages to make a book if they like. Here is a Capitoline Geese Legend cover for the book as well. There are two covers on each of these sheets. We printed our covers on colored paper. The city of Rome was built on seven hills. The Capitoline Hill was where the rich people lived and where the public buildings like temples and the senate chambers were located. It was no mistake that that is the part of the city that the Roman soldiers were ordered to protect. During the siege the ordinary citizens lost everything. When it was all over and they came back home the senate carried on like nothing had happened, taxing the people as before. This was obviously a great hardship and many now destitute citizens ended up in debtors prison or begging in the streets. Marcus Manilus, who had gained notoriety for his defense of the city, spoke up condemning the actions of the senate. They had him killed as a traitor for stating his opinion, but he did start a movement of reforms that gave more power to the common people. Discuss this attitude of the rich senators toward the rest of the people. Is this typical among all governments or unique to Rome? How can the common people defend themselves from their own government? The resounding military victory of the Gauls embarrassed Rome and made them realize that they had better get their army updated. It is from this point that the Romans abandoned the ancient Greek methods of fighting and developed the highly trained legions that would rule the greater part of the known world in a few centuries. Think of more modern examples (from the last hundred years) of armies realizing they had to innovate with new strategies or technologies. What innovations do you think might be necessary for defeating the enemies of today? The Capitoline Hill was the seat of government in Rome and is where we get the words capital, which means the city that hosts the government in a country, and capitol, which means the building that the government meets in. An enormous amount of our language and culture can be traced back to Rome. Rome was so powerful and so stable and long lasting that even 1600 years after its fall in the west we still feel the effects. Make a list of other government or cultural concepts you know of that we have from Rome. This activity has kids put the story in order. This is a good time to practice story order and to talk about how stories have beginnings, middles, and ends. If you liked this exploration you might want to learn more with our unit on the Ancient Roman Republic.